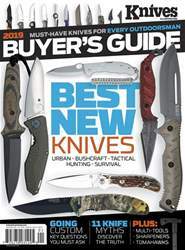 BUYING ONLY STOCK KNIVES? THE CUSTOM WORLD MAY JUST CHANGE YOUR HABIT! There’s a lot of mystery when it comes to custom knives and the makers behind them. Many say that the price of a custom knife is unjustifi ed when compared to mass-produced alternatives. Others would argue; custom knives allow for quality and comfort that can’t be replicated in mass-produced alternatives. The reality is a bit more complicated. There are several different types of custom knifemakers. The term “custom” itself would imply an individual can have any design they want made. While this is true with some makers, it’s not always a possibility.